It doesn't get much easier than this. 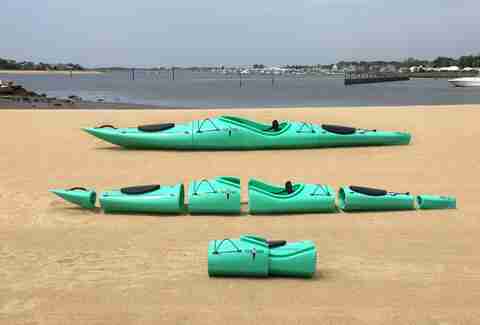 A new company has developed an entire rigid kayak that breaks down into small pieces that fit inside of each other like Russian nesting dolls. Once it's fully broken down, it's the size of a back pack and can be schlepped wherever you're headed. Weighing just 55 pounds, the Pakayak is very light for a kayak and pretty damn heavy for a back pack. The 14-footer is fully waterproof, as you might suspect, rolls like a usual kayak, and is sturdier than folding or inflatable versions. 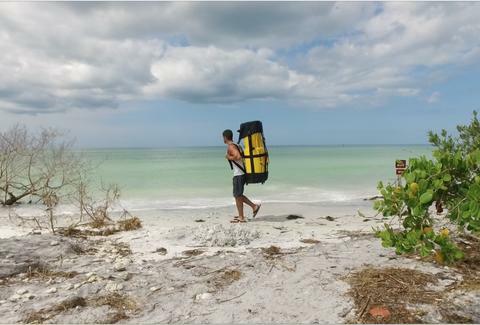 The team at Pakayak claims the whole thing, with its patented clamping system, can be assembled in under five minutes. Between the ability to store it in a space as small as a New York apartment and the quick assembly, it's less hassle than dealing with Apple's constant upgrades. It makes kayaks accessible for people living in urban locations or who don't have a truck capable of hauling a boat to the river. At the early adopter price tag of $1,495, it's on par with what you'd expect to pay for a kayak. That price is available through Kickstarter, where the team is raising funds to start production. They've already raised nearly $200,000 with over two weeks to go. You'll need to make other plans for this summer though. First deliveries are scheduled to be sent out in March 2017, while everyone is lamenting the fact that Game of Thrones Season 7 still isn't out.